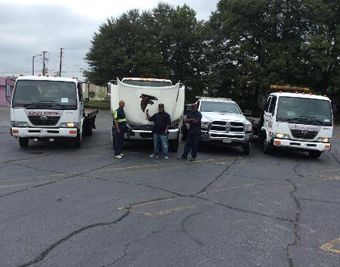 King's Towing Atlanta GA Medium Duty Towing King's Towing Atlanta GA medium duty units are designed to handle an array of vehicles from bucket trucks to business class box vans and small buses. We understand the need for your company vehicles to be on the move, so when you call, we move! King's Towing Atlanta GA can Assist you in the following Medium Duty Towing needs: • Small Fleet Vehicle Towing such as FedEx or UPS • Camper or Recreational Vehicle Towing • Step Van Towing • Delivery Truck Towing • Semi Road Service Repairs • Commercial Breakdown Assistance • Towing from 7,500 GVW to 25,000 GVW • Fleet Accounts Receive a Discount Take the guesswork out of having a reliable solution for your company's mobile breakdown and repairs and call King's Towing Atlanta GA Today at 678-933-1672!